The idea sounds less than appetising: feed ripe coffee beans to a civet cat, collect what comes out the other end and make coffee from it. 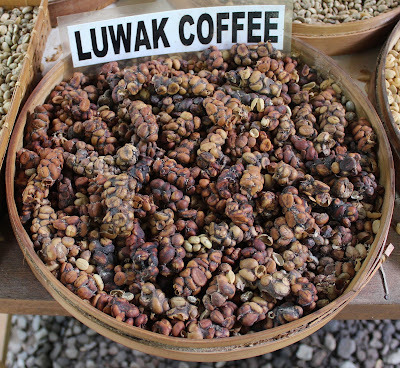 If you did this you'd be producing the most expensive coffee in the world, kopi luwak. It is expensive for good reason: it's rare and it's delicious. Having had a cup of it recently in Bali, I'm a convert. It was strong and very, well (try not to think too much about it) very smooth. An Asian palm civet, known in Indonesia as a luwak. Civet cats are not cats but species of mammals that live in rainforests in Africa and Asia. The coffee-makers of Indonesia are Asian palm civets. They eat the coffee berries and, somehow, the defecant, when later washed, dried and roasted has changed. Coffeeologists disagree on the reason for this. 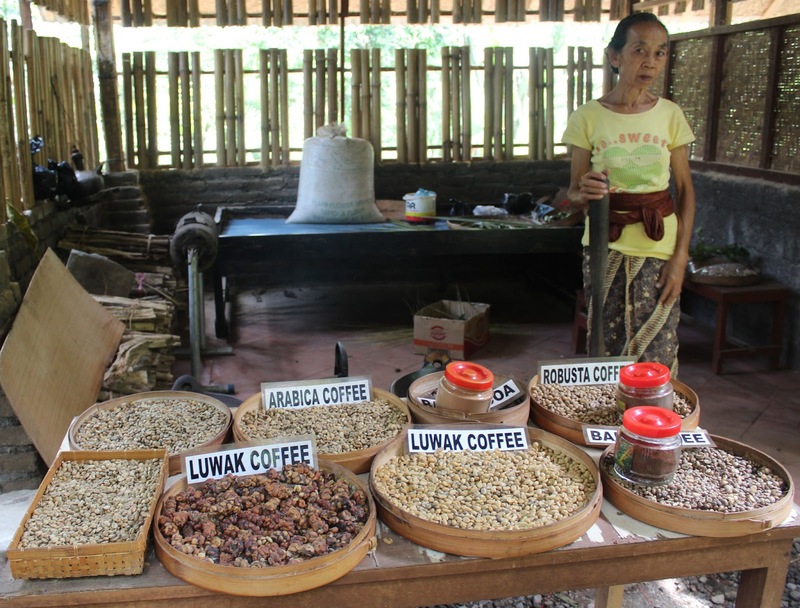 It could be the action of enzymes in the civet's gut that changes the coffee or maybe civets are just very selective about the coffee berries they eat. 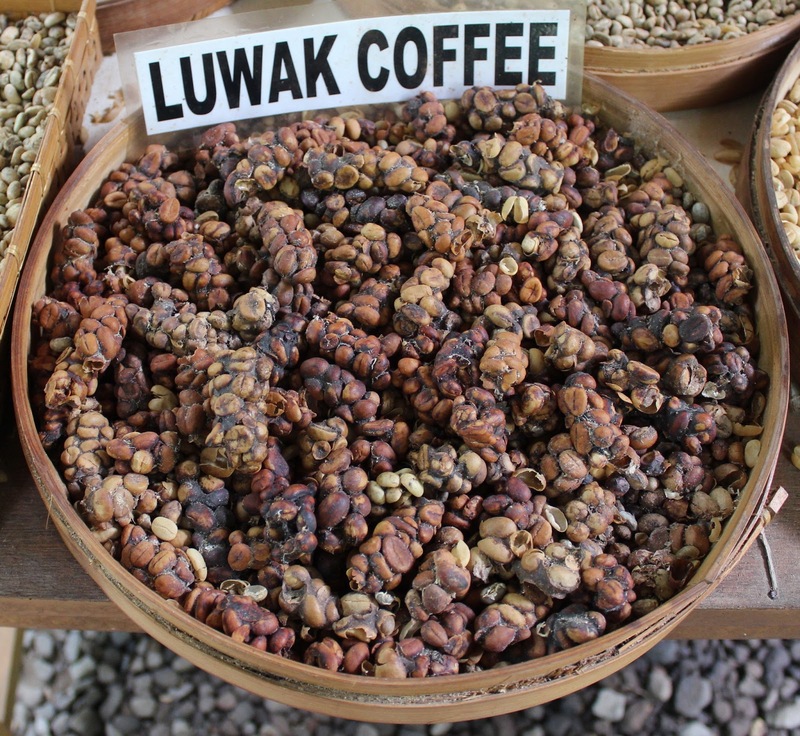 The coffee beans as they come out of a luwak. 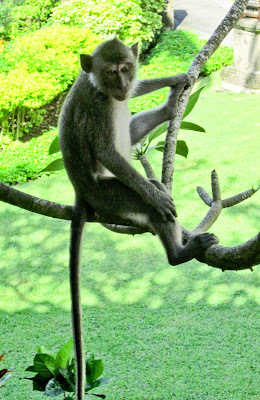 Sometime in the 17th Century some intrepid soul, walking through a forest in Indonesia where there were coffee bushes, and dying for his morning cup of java (actually it would have been in Sumatra, which is where the Dutch introduced arabica coffee from Yemen) must have spotted some civet droppings and thought (you coffeeholics will relate to this) what the hell, any port in a storm, and picked it up. The rest is coffee history. This woman is grinding coffee beans with a large mortar and pestle. 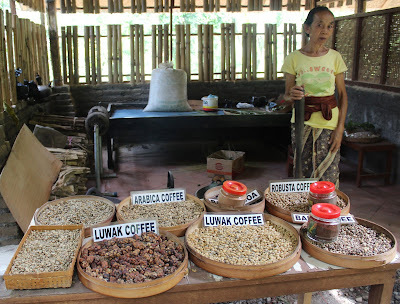 We'd heard about kopi luwak but never tried it till we were touring an agritourism venue near Ubud in Bali. Our guide showed us various plants and trees that produce some of Bali's produce---jackfruit, longans, anise, lemon grass etc---and there, in some cages were civets. We were given cups of various teas, coffees and other herbal drinks. 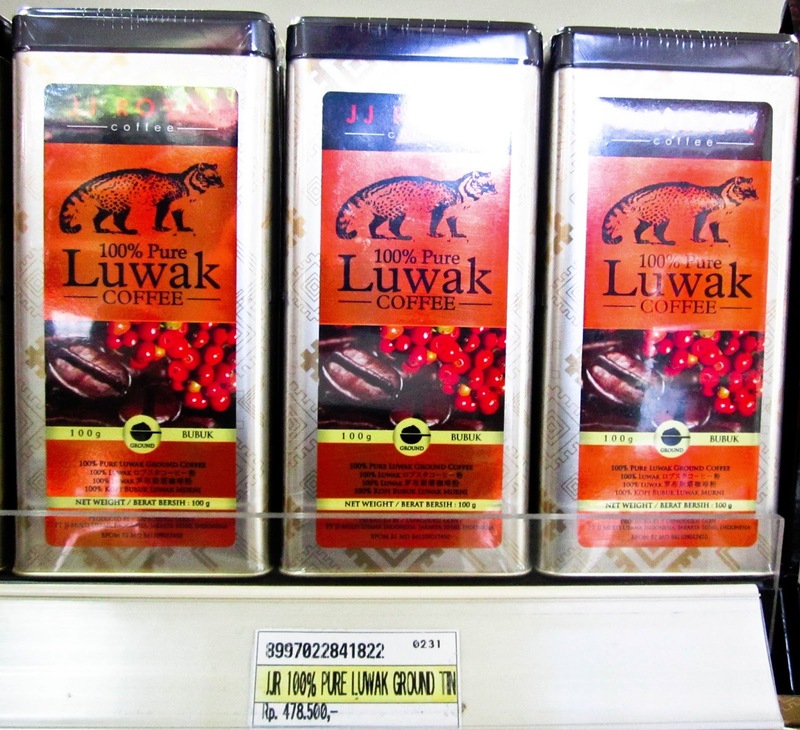 For kopi luwak there was a charge but at only $ 5 per cup this was a bargain we couldn't refuse. 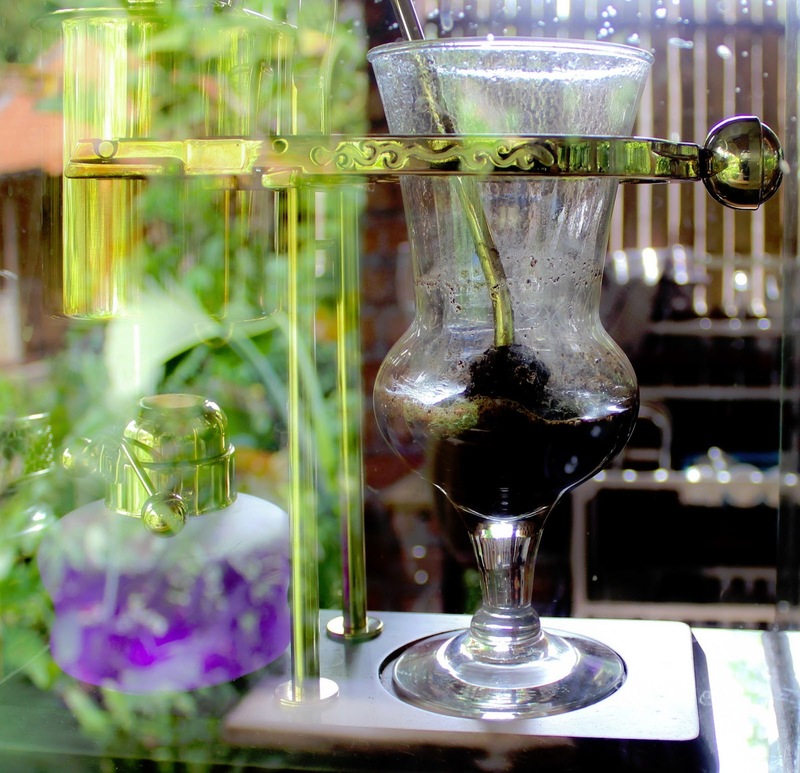 On the left is a burner heating a copper beaker and on the right, the kopi luwak in a parfait glass-like flask. The coffee was brewed in what looked like chemistry equipment from Marie Curie's laboratory. I'm only sorry I didn't get a better photo before the water boiled over into the gummy mess that was to be our coffee. We drank it black with a bit of cane sugar. It may have been crap but it was very tasty. 100 grams could be yours, in Bali, for $ 50, which by world standards is dirt cheap. Heads of state give each other valuable gifts on state visits. On his last visit to Indonesia, Barack Obama was given a sizeable quantity of this coffee. If it was a ploy to get him to come back, it worked: he'll be at the APEC conference in Bali in October, undoubtedly holding out for a bottomless cup of kopi luwak. There are other coffees yet to try. 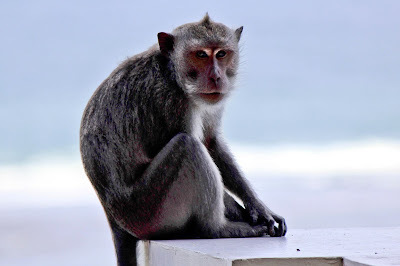 One is monkey parchment coffee what is chewed and then spat out by rhesus monkeys in India. We might give that one a miss. We had thoughts of making home-grown poo coffee but Jasper was unmoved. I haven't stayed in many five-star hotels so I never really know what to expect but being attacked by a pack wild and vicious monkeys in the corridors was far from my thoughts when it happened last week in Bali. 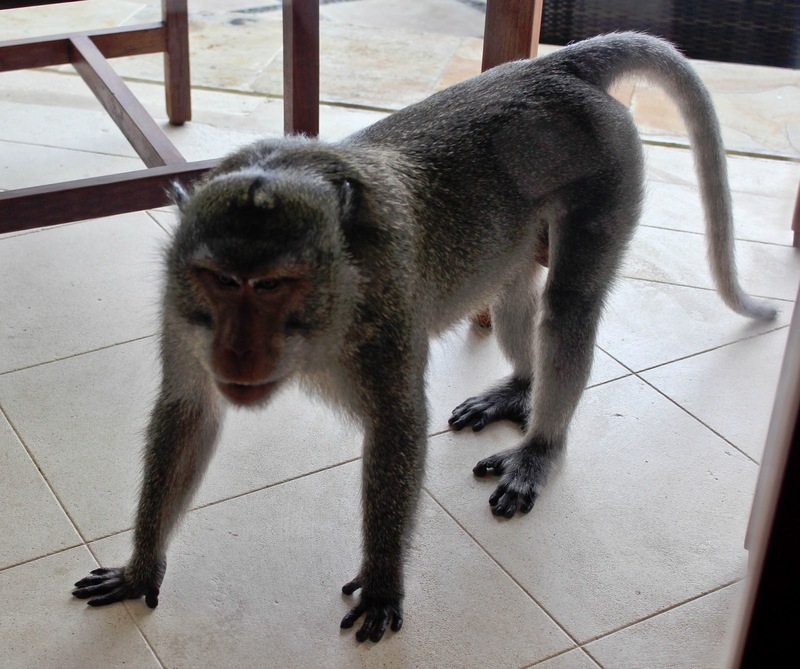 We were staying in a resort hotel on a beautiful bit of coastline right in the heart of a monkey-filled forest. 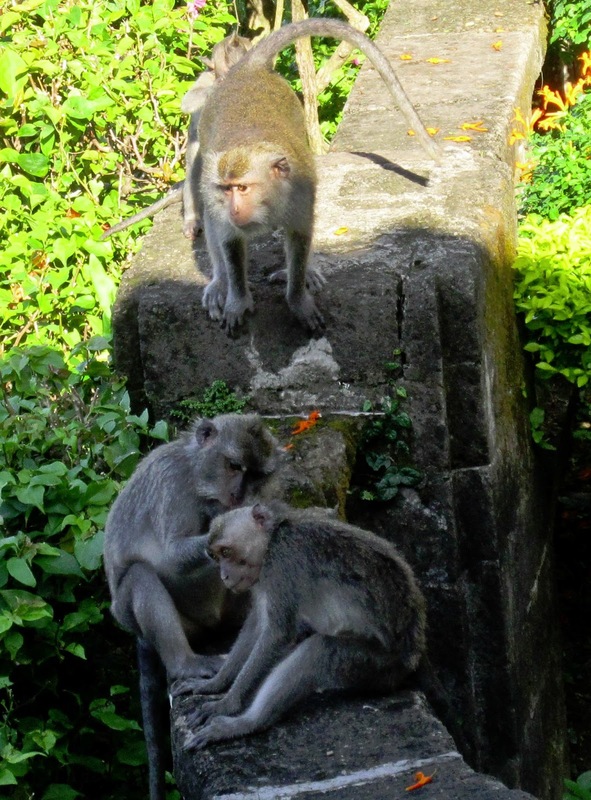 We'd seen monkeys around the grounds of the hotel---they were Balinese Long-Tailed Macaques (Macaca Fascicuiaris) We'd also seen a sign warning guests not to feed them. We know monkeys carry diseases and can be extremely vicious. 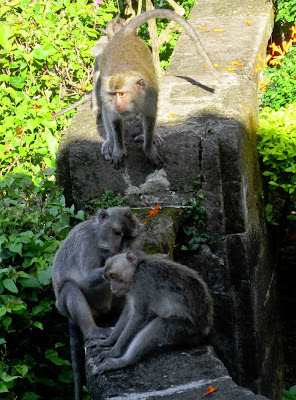 Last year we had a close and uncomfortable encounter with a different species of macaques while bushwalking in Malaysia. 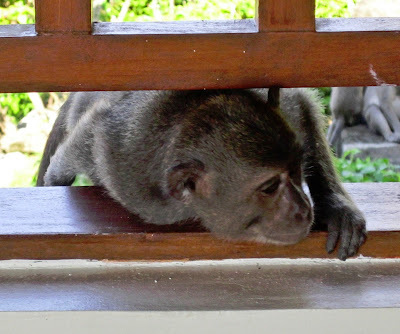 The hotel employs two monkey wranglers who carry sling-shots to ward off troublesome monkeys. A Balinese long-tailed macaque saying g'day or maybe selamat pagi. Our room was on the seventh floor but that didn't keep the monkeys from coming to our balcony in search of food. Very sensibly, we kept the glass doors to the balcony closed. A family of monkey's enjoying the view from our balcony. A grumpy monkey challenging a smaller one. Walking across the glass screen at the end of our balcony. 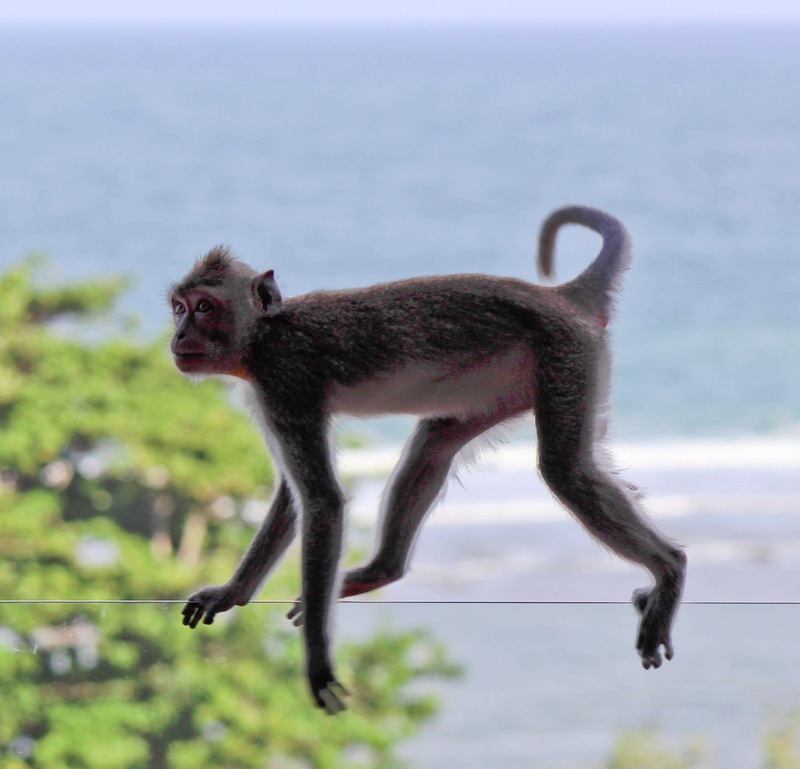 Monkeys are fun to watch. I've always had a soft spot for them tempered by the good sense not to get too close. When I was nine years old, living in Alaska, I helped a friend with his paper run. Part of it took us to an army barracks where there was a monkey in a cage---perhaps the first Arctic Monkey. The owner was a soldier who had gone off to the war in Korea and the soldiers didn't know what had become of him. 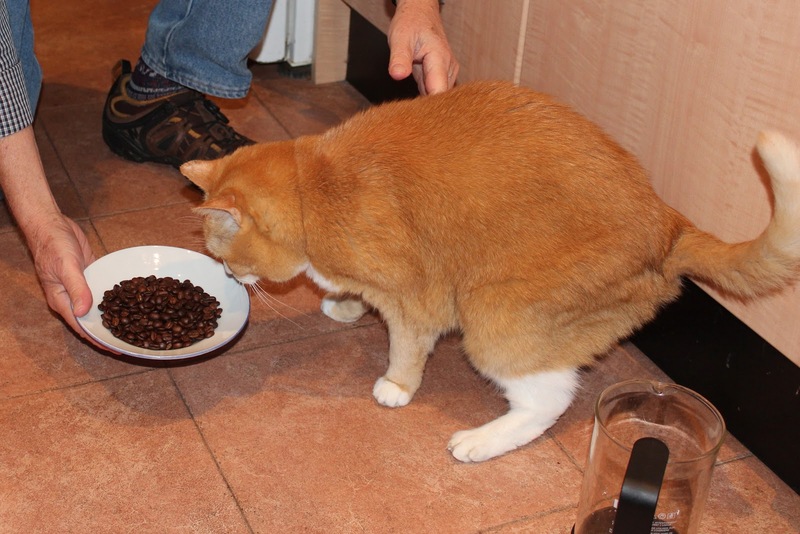 They didn't know whether he'd return to his beloved pet. To make the story even sadder, the monkey had recently gone blind. I'm sure there's a children's book in this but I don't think I'll be the one to write it. I never knew how it ended. This guy could see our fruit bowl but there was no way he was coming in. The attack happened on the fifteenth floor of the hotel. 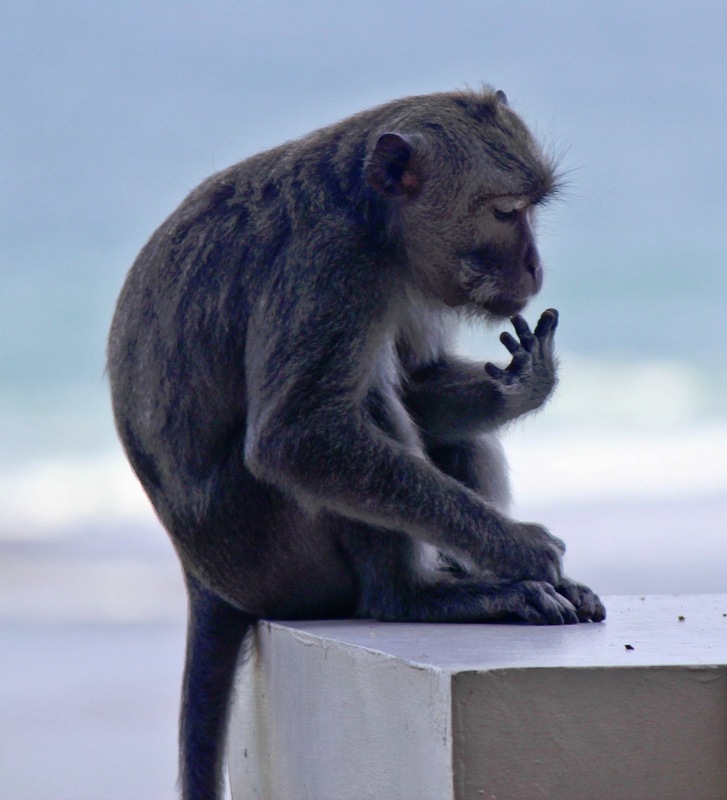 The monkey gauntlet: where we came to grief. Jill and I were walking along an open corridor and there were monkeys playing down below. The young ones were chasing one another through flower beds and up and down trees doing as much damage as any adolescents on a rampage. There were at least twenty of them and I took out my camera and started snapping. Quite obviously posing for me. Some of the rest of the troop nit picking in the hotel gardens. 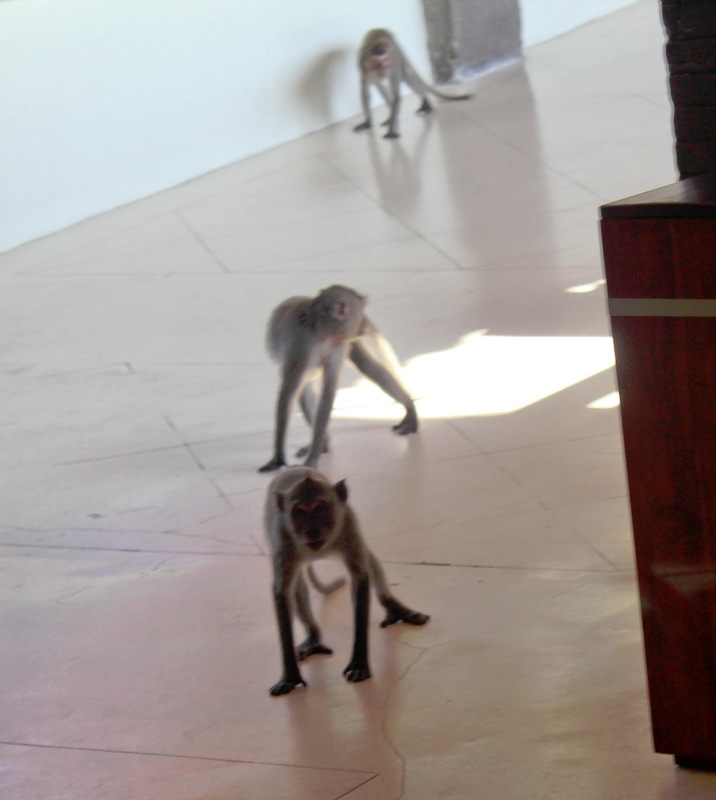 Some of the young monkeys came up to the walkway and climbed around the rafters. 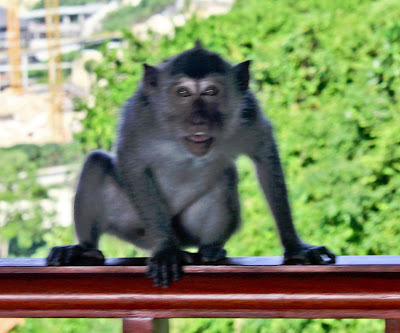 Everything was okay till I looked over a railing, not knowing that there were two monkeys just out of sight below. One of them let out a warning screech and then they both turned around and started screeching what I can only imagine was, "Get the guy in the cheap Balinese batik shirt! Rip him to shreds! Bite him into next week!" Climbing into the corridor to see what the fuss was about. 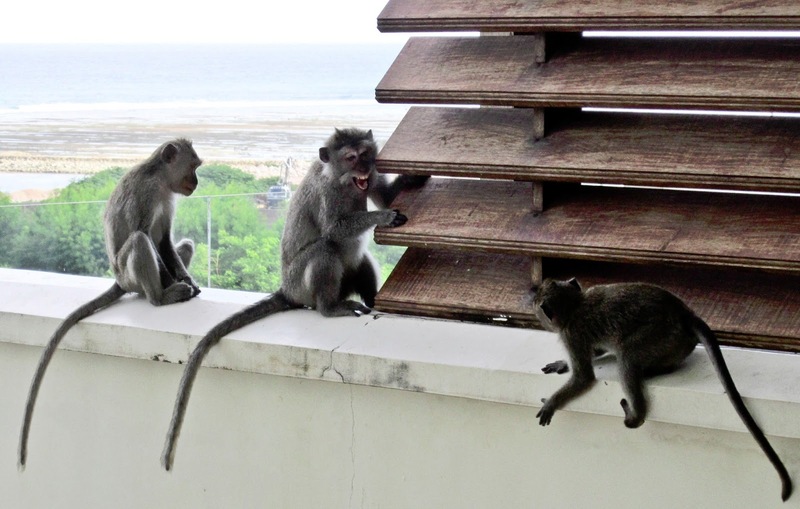 Screeching monkeys appeared from everywhere. I backed away quickly but afraid that if I ran I'd be covered in monkeys. Jill was further from the action and ran along with a terrified woman. I backed around a corner into the building proper hoping for monkey wranglers with sling-shots. This is when I knew I was in trouble. 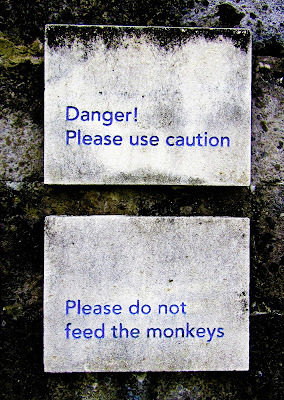 Around a couple of corners, the monkeys kept coming---maybe a dozen of them. Then I heard Jill call out, "In here! I'm in the elevator! Quick!" The leaders of the attack pack photographed by a rapidly retreating hotel guest. 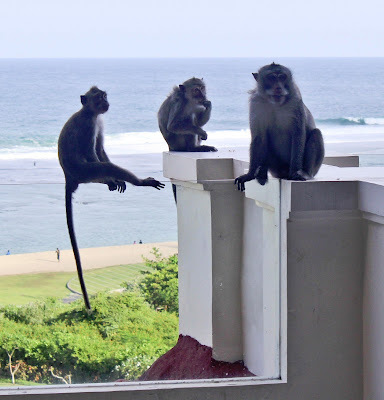 It wasn't till the elevator doors closed and there were no monkeys in it with us that we breathed sighs of relief and laughed nervously. We looked around before getting out of the lift at our floor to make sure they hadn't watched the floor indicators and climbed down to greet us. They hadn't. We were safe, unscathed and with something to blog about. I should add that Bali was wonderful. I don't know why we left it so long to go there. Maybe it was because everyone we knew had already been there---hardly a good reason. I'm sure none of them had the same experiences we did.